KIBBLEWHITE describes its latest valve guides as being designed with the price-conscious engine builder in mind. The manganese bronze valve guides have the usual exacting Kibblewhite tolerances, but with reduced toughness/wearability when compared to the company's premium C630 nickel aluminum bronze valve guides. The softer manganese guides are said to be easily reamed, and then can be delicately finished with Kibblewhite's high quality ball hones. 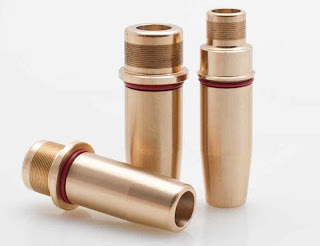 In fact Kibblewhite states that with any battery-operated or electric drill, users can ream and hone manganese valve guides in less time, and in the absence of expensive honing equipment required to properly size nickel bronze guides.